The Blot is a huge fan of Neil Gaiman’s Coraline – both the book and Laika’s stop-motion animated feature film. So when Funko announced a new line of Coraline Pop! Movies vinyl figures, The Blot was ecstatic! I’ll take all the Coraline toys and figures I can get! The Coraline Pop! Movies Series includes Coraline with Cat Buddy, Coraline in Raincoat, The Other Mother, Coraline Doll and Mr. Bobinsky with Mouse. The Coraline in Raincoat Pop! even has a 1-in-5 chase variant Coraline in Raincoat and Hat. 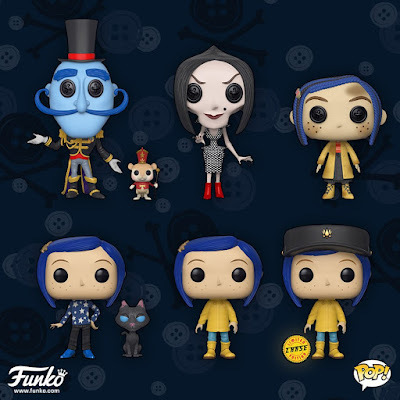 Each Coraline Pop! vinyl figure stands 3.75” tall, features one point of articulation and comes packaged in a full color displayable window box. Collectors can pre-order these new POP! Movies figures now at Entertainment Earth for $10.99 each here.